A New Barely There Foundation – Am I Converted? 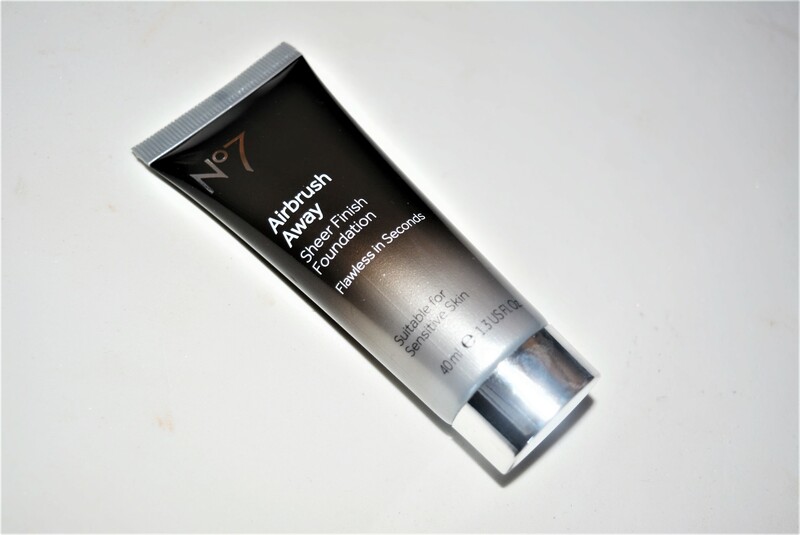 I was lucky enough to be sent No7’s airbrush away foundation in both light and medium. I am going to talk about the in’s and out’s of it below, so if you’re considering buying it or if you’re looking for a sheer finish foundation you can hear a truly personal opinion. This is a big step for me, I am full coverage kind of gal and any freckle, blemish or red patch sticking out infuriates me. I don’t feel like my everyday makeup is ‘heavy’ I just know what to cover and where to cover. However, as you can imagine in the summer this look fails me every year. Foundation rolling down my face, mascara sweating out of my eyes and my stay matte powder slowly cracking at the seams is a horrifying look and one that regularly occurs. I wanted to try something a bit lighter this year, a ‘barely there’ kind of look. It’s hard for me to even begin to imagine this kind of look on myself but I am excited to try it out. This airbrush foundation is meant to make your face look ‘flawless’, evening out your skin tone and giving you a soft finish. I have never worked well with BB creams or tinted moisturisers in the past so my hopes weren’t set very high. I love the idea. That’s the first thing I thought, I know that’s strange but the thought of wearing makeup but not wearing makeup on summer days just made me so intrigued. However, I also was a little put out by the price. I know I received the foundation to try and I know No7 is usually quite expensive but for a 30ml bottle it’s around 16 pounds, I understand if you love a certain makeup product or just prefer paying a bit more this won’t be a lot to you but I enjoy picking up bargains and my usual foundation costs me anywhere between 5 pounds and 8. I think unless I suddenly fall in love with this foundation it wouldn’t be something I picked up time and time again. Something else that jarred me a little was that it only comes in three shades (light, medium and dark). I know the foundation is new and I know a lot of people can get away with such a small spectrum of colours but I usually cannot. I have freckles and an uneven skin tone, I usually find myself somewhere between the lightest light and Ivory colours, I also know that ‘dark’ won’t cut it for a lot of darker skinned men and women so that’s something else that didn’t thrill me. In the photo below is my swatch of the shade ‘light’ and it appears a lot darker than it looks on the skin. I am super white and it didn’t look orange at all. I moisturised and then applied it with my finger, I didn’t use a brush because it is so smooth and weightless that I didn’t want to lose too much product in the brush. It feels like a mousse foundation, except it’s so velvety soft. I applied blob over my cheeks, forehead and chin and gently rubbed it all in. At first, I was a little disappointed, I think this is down to it not being medium-heavy coverage that I’m used too. I didn’t see much difference in my skin and seeing my freckles on full force just isn’t something I am totally comfortable with yet. I left it on and got on with work and when I passed the mirror again I decided to take a proper look. It does make your skin even, it’s weird it’s almost as if a filter has been applied and you look a bit ‘smoother’. The coverage isn’t great (it isn’t supposed to be), the blemishes on my chin were blurred and I looked like I had no makeup on but I did because my skin wasn’t all uneven like it usually is without makeup. Aside from it making me look like an edited photo, the colour wasn’t very significant which did just highlight how much you might not like it if you are like me and like to cover up most days. However, if you’re looking for something lightweight, soft and barely there but there enough to cover blemishes and cover up skin tone it really does its job. If you read my blog you will know I am the biggest fan in the world of the Rimmel ‘wake me up’ foundation, their colour ranges are amazing and the coverage is perfect for me and I think I would struggle to change my foundation at this stage. When I say I wouldn’t swap it isn’t because I didn’t like it, it’s just that I do prefer more coverage than this gives. However, for beach days, lazy days and days when my skin cannot take any more I really do believe I will wear this sheer finish foundation as a little skin ‘pick me up’ as it did a good job of blurring out imperfections and putting a nice little instagram-esque filter on my face that made it look all even. It’s ideal for people who don’t really like wearing makeup but need ‘something’. For beach days, pool days, school and any other time you may need to cover up but not cover up at all I do think it’s wonderful. Personally, it’s not for me. The coverage isn’t enough for what I would want to wear day to day but for people who like sheer foundations and wearing only a little foundation in order to even out skin tone, it’s a really lovely product.